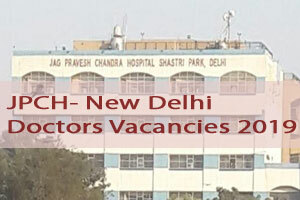 New Delhi: The Jag Pravesh Chandra Hospital, New Delhi (JPCH New Delhi) released 11 Vacancies for Senior Resident post on Adhoc /Emergent Basis. The Selection will be done on the basis of Walk-in-interview. Applications are invited for the appointment of Senior Resident Doctors in the hospital. Application forms can be obtained from the Administration Branch of the hospital on the date of the Walk in Interview. Candidates are required to submit the duly filled in application form along with copies of certificates and testimonials (duly self-attested) and one passport size photograph at the time of interview. The Vacancies are in the Department of Obstetrics & Gynaecology, Pediatrics, Radiology, Pathology, General Medicine, Surgery, Anaesthesia, Ophthalmology. Qualification: MBBS with PG Degree/Diploma/DNB in the concerned specialty from a recognized University/Institution and should have a valid registration with Delhi Medical Council. Must have not completed 03 years Senior Residency in any recognized institution including Regular & ad-hoc period. Age: 37 Years for General and OBC candidate on the closing date of submission of application. One post is reserved for Physically Handicapped person as horizontal reservation of SR.
For OBC candidate, the OBC certificate must be issued from Delhi. 1. In case of non-availability of candidate with PG Degree/Diploma, candidate with two years experience during PG Degree/Diploma in the respective specialty will be considered. 2. In case of non-availability of fresh candidates, the candidates who have completed 3 years of Sr. Residency may also be allowed to appear in the interview. 1. The number of vacancies of SRs may vary. 2. No TA/DA will be paid for appearing in the interview.